UCL scientists have carried out the first successful transplant of light-sensitive photoreceptor cells extracted from a synthetic retina, grown ‘in a dish’ from embryonic stem cells. When transplanted into night-blind mice these cells appeared to develop normally, integrating into the existing retina and forming the nerve connections needed to transmit visual information to the brain. The study, funded by the Medical Research Council (MRC) and published today in Nature Biotechnology, suggests that embryonic stem cells could in future provide a potentially unlimited supply of healthy photoreceptors for retinal cell transplantations to treat blindness in humans. The loss of photoreceptors – light sensitive nerve cells that line the back of the eye – is a leading cause of sight loss in degenerative eye diseases such as age-related macular degeneration, retinitis pigmentosa and diabetes-related blindness. There are two types of photoreceptor in the eye – rods and cones. Rod cells are especially important for seeing in the dark as they are extremely sensitive to even low levels of light. Previous work by Professor Robin Ali and his team at the UCL Institute of Ophthalmology and Moorfields Eye Hospital has shown that transplanting immature rod cells from the retinas of healthy mice into blind mice can restore their sight. However, in humans this type of therapy would not be practical for the thousands of patients in need of treatment. Using a new laboratory technique involving 3D culture and differentiation of mouse embryonic stem cells, which was developed recently in Japan, Prof Ali’s team were able to grow retinas containing all the different nerve cells needed for sight. Professor Ali, UCL Institute of Ophthalmology and Moorfields Eye Hospital, who led the research, said: “Over recent years scientists have become pretty good at working with stem cells and coaxing them to develop into different types of adult cells and tissues. But until recently the complex structure of the retina has proved difficult to reproduce in the lab. This is probably because the type of cell culture we were using was not able to recreate the developmental process that would happen in a normal embryo. 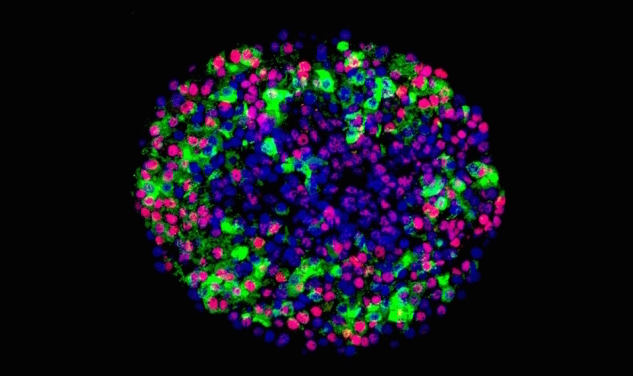 The researchers grew retinal precursor cells using the new 3D culture method and compared them closely with cells developed normally, looking for different markers at different stages of development. They also carried out tests to look at the genes being expressed by the two types of cells to make sure they were biologically equivalent. They then transplanted around 200,000 of the artificially grown cells by injecting them into the retina of night blind mice. Three weeks after transplantation the cells had moved and integrated into the recipient mouse retina and were beginning to look like normal mature rod cells. These cells were still present six weeks after transplantation. The researchers also saw nerve connections (synapses), suggesting that the transplanted cells were able to connect with the existing retinal circuitry. UCLB will be working with Robin in translating this into a therapy for humans.